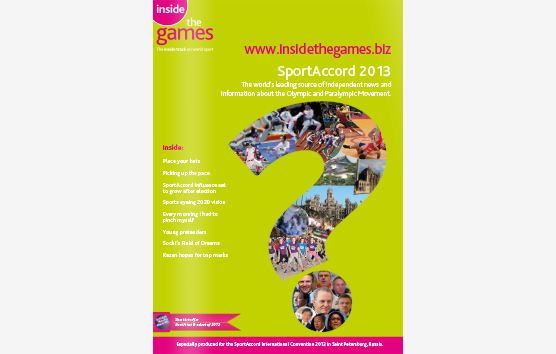 We are delighted to announce that our print product – the insidethegames.biz SportAccord magazine - has been shortlisted for the British Media Awards 2013. The insidethegames.biz SportAccord magazine – produced annually and specifically for distribution at the SportAccord International Convention – joins some of the best-known names of British media in the Print Product of the Year category. Other shortlisted entries include GMG Media's Guardian Weekly, Racing Post's Pocket Post, The River Group's Weight Watchers Magazine, Future's Digital Camera and Associated Newspapers Metro. The 44-page magazine goes through an in-depth and detailed production process, which is carefully and personally managed by managing director, Sarah Bowron. The result is like a paper-based insidethegames.biz – in-depth, authoritative and insightful articles, written by some of Britain's best Olympic journalists, funded by advertising revenue, showcasing sister products of insidethegames.biz, and led editorially by Duncan Mackay – Britain's leading journalist in the global Olympic Movement. It is always produced on the highest quality paper stock to reflect the high quality of the entire portfolio of publisher Dunsar Media's products and publications. Sarah Bowron, Dunsar Media's managing director, said "We are delighted the insidethegames.biz SportAccord magazine has been shortlisted for the Print Publication category in the British Media Awards. We are the only small independent publisher shortlisted which makes our achievement even more immense. We are extremely proud to be in the company of the heavyweights of British publishing." The British Media Awards are designed to highlight the best in business across the entire media industry and have quickly become the standard that those leading this sector measure themselves and their peers by. Winners will be announced on May 2 at a ceremony at the Marriott Grosvenor Square in London. You can read all the insidethegames.biz printed publications online for free here. insidethegames.biz is the No.1 Olympics news website in the world, with 5 times the traffic of its nearest competitor (1), and ranked as the 6th most influential Olympics website in the world behind the IOC, Sochi 2014, London 2012, NBC Olympics and NBC Sport (2). Breaking the news as it happens 24/7/365, insidethegames.biz brings you the latest, most up-to-date news and interviews from the worlds of Olympic, Commonwealth and Youth Games. Edited by Duncan Mackay, one of the worlds foremost Olympics and Commonwealth Games journalists, Mackay is a former winner of Sports Journalist of the Year, Sports News Story of the Year and Sports Internet Writer of the Year. The magazines target audience is International Olympic Committee Members, Commonwealth Games Federations, National Olympic Committees, International and National Paralympic Committees, Organising and Bidding Committees of Olympic, Paralympic, Youth and University Games and their sponsors, International and National Sports Federations, suppliers and sponsors to Mega-Sports Events, the International Press, both broadcast and written, plus sports administrators. The magazine is published each year on the first day of SportAccord. In 2011, SportAccord was at the beginning of April. In both 2012 and 2013, SportAccord is at the end of May. (1) Source: Alexa.com the world's leading source of independent website metrics. (2) Source: Klout.com the world's leading ranking system for website influence.